What do you think of this One Click Stick Butter Cutter? Tired of cutting butter yourself? Leave it up to the one click butter cutter to do all the hard work for you. 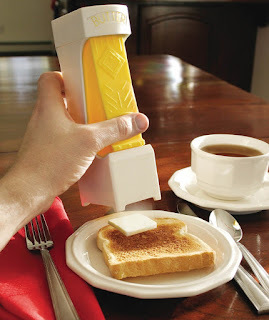 The one-click butter cutter holds and slices butter into pats with just a squeeze. Easily loads a complete stick of hard butter. Slices can be cut and dispensed with one or two hands. Measures out butter with 4 slices per tablespoon. No mess-no fuss. Keep hands and butter clean.